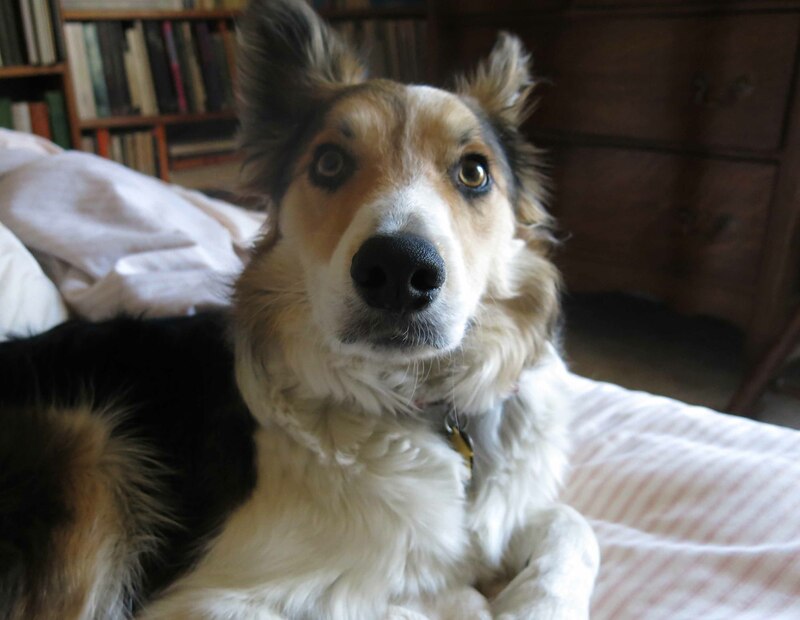 Greetings and salutations, everyone; yes, once again it is I, Mani the actually fairly normal-sized purebred border collie, filling in for the guy I live with, and here to bring you the latest and windiest news from our garden. You may remember me from such speed-related posts such as “A Velociraptor’s Day”, among so many, many others. Here I am in a characteristic pose. I’m kind of upstairs on the bed because today is super windy and I’m not used to that. There are scary noises. And stuff blowing around. It’s only been freezing here a couple of nights in the last month or so, and hasn’t rained or snowed, but I guess it might later this week. There will be plenty of mud to track in, I imagine. I got another Star Student award at Day Care last week, and got to see Norm again, just the other day, and he was a lot closer this time. I dragged the guy I live with all the way down the creek path, totally forgetting the Star Student stuff I learned, but Norm was on the other side, looking over his shoulder from time to time, being of course intimidated by the guy I live with’s tough demeanor, and my even tougher one. While I was being a star student, the guy I live with and his friend visited the crevice garden at the Apex Recreation Center in Wheat Ridge. 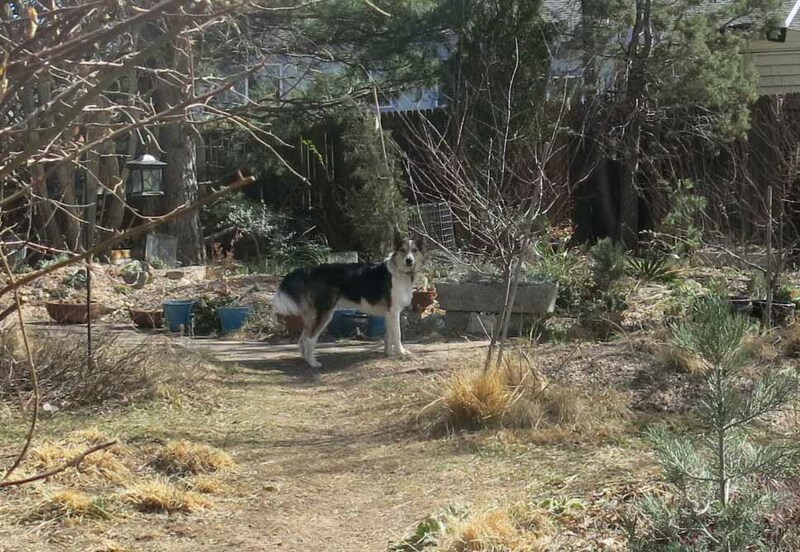 He had heard of it and seen pictures, but now he’s all jealous and everything because he wants the back yard to be nothing but a giant crevice garden, except with places for me to race around the garden. The crevices are filled with permeable soil so all the water goes right to the plant roots. It does need more plants, and the guy I live with has some, to plant there. I think a few years ago the guy I live with thought about building one of these by himself. I know what it would have looked like, and so does he, which is why he didn’t build one. 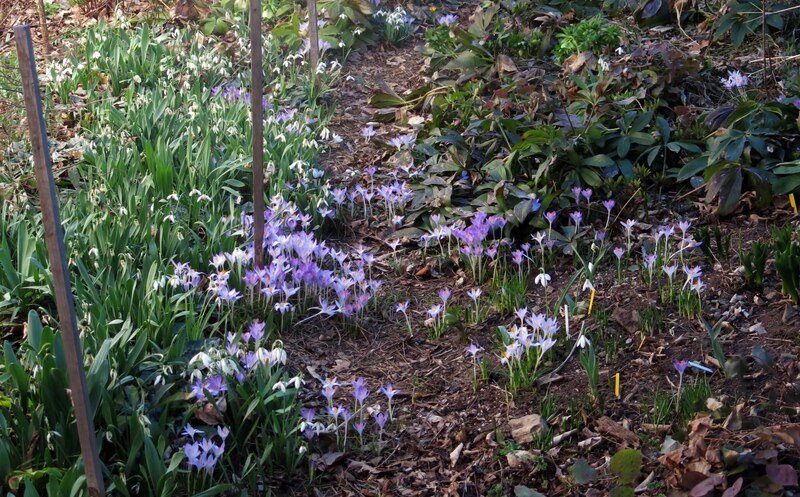 In the shade garden, which isn’t very big, the snowdrops are almost done, and there are lots of crocuses, Crocus tommasinianus, starting to flower. They’ve been seeding around for some years now. Here are just some of them. And the guy I live with’s favorite shrub, Viburnum farreri, is flowering. He says this is pretty late; it can start in December, but remember we had the snow and ice on the ground for weeks, and the complaining, and all that, so it’s flowering now instead. I guess this is a crummy picture because the guy I live with doesn’t know how to use the macro function on the point-and-shoot, but I think you get the idea. He says the flowers are scented of heliotrope, whatever that is. Let’s see; what else? 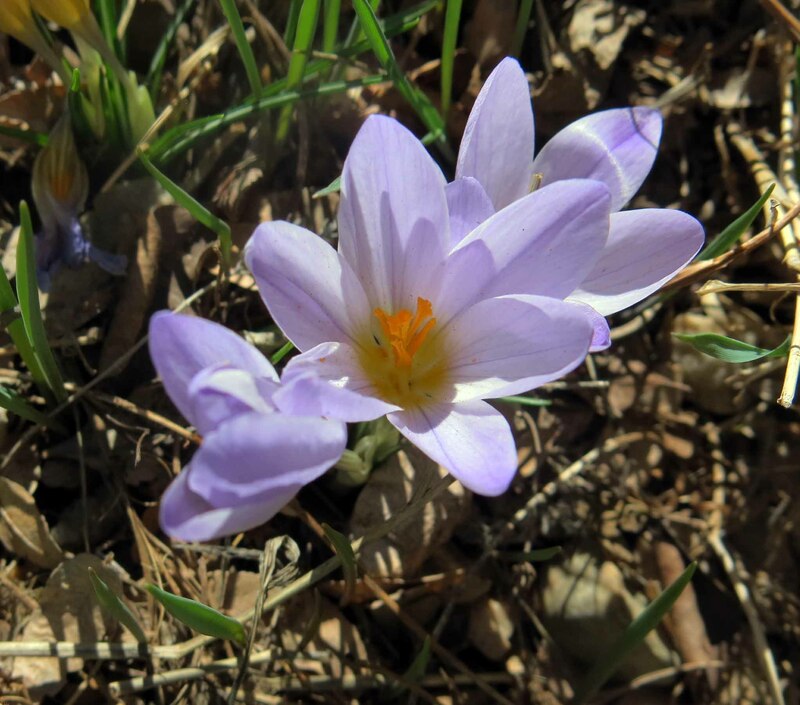 Oh, there are lots of other crocuses flowering. Otherwise the garden is kind of dry and brown. I hear that’s okay. Most people would prefer it greener, but the guy I live with just says “Whatever”. And he put up an anti-me fence in the way back. 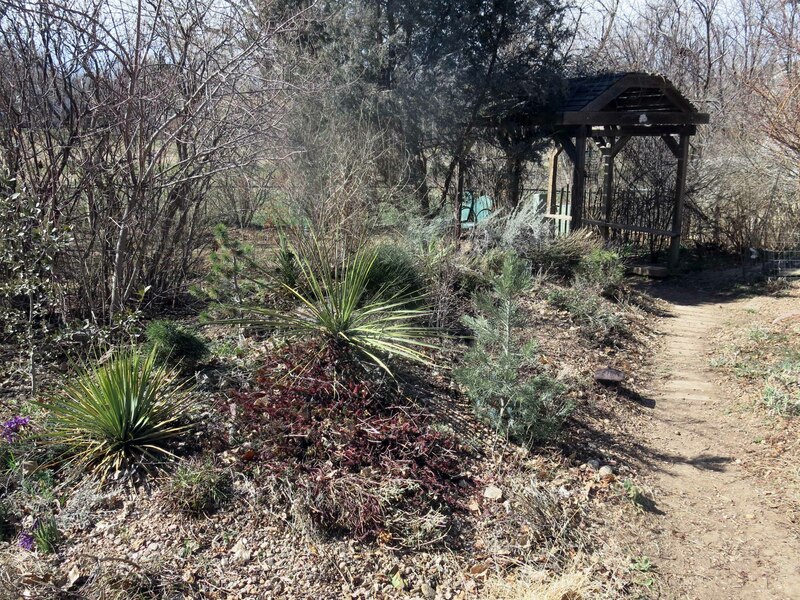 I do admit I was getting carried away, racing into this garden, which is in pretty bad shape. What’s even worse, and talk about a boatload of complaining, if not whining, is the state of the back lawn. You can see all the little green bits which are coming back. You may remember that he took out the green lawn and put in buffalograss, and now he’s talking about putting back the green lawn. Yes, I know. I guess that’s pretty much it. If there’s more, I’ve forgotten it, or the wind blew it away, just like that. That crevice garden is super but it does seem relatively plant-free. None of the slots really look big enough for the Viburnum farreri so perhaps the jealousy is misplaced. 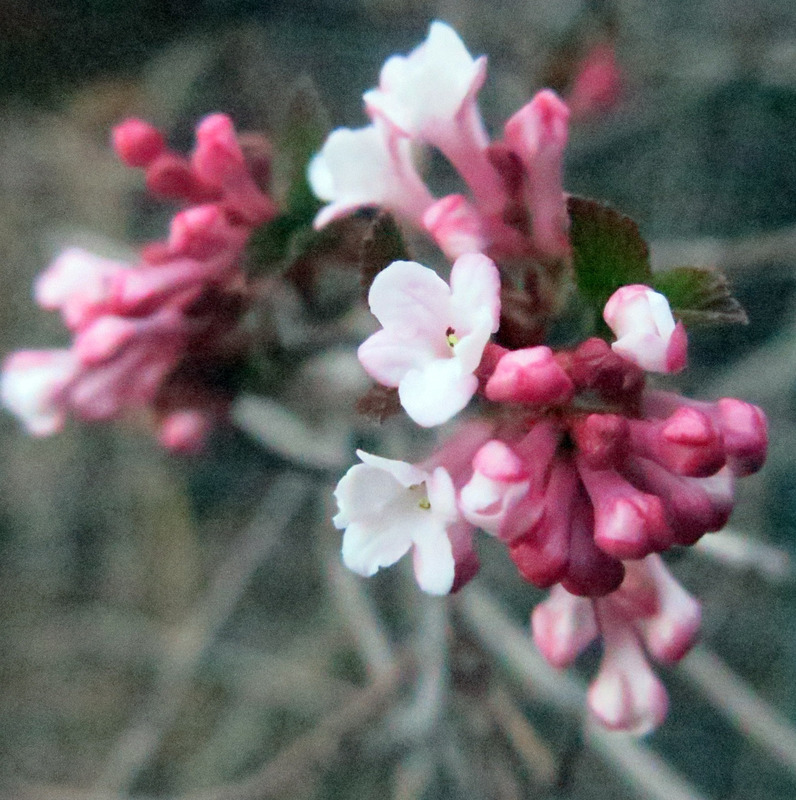 I have Viburnum bodnantense Dawn which looks very similar but the bloom time was so brief, here then gone. How long does yours bloom? 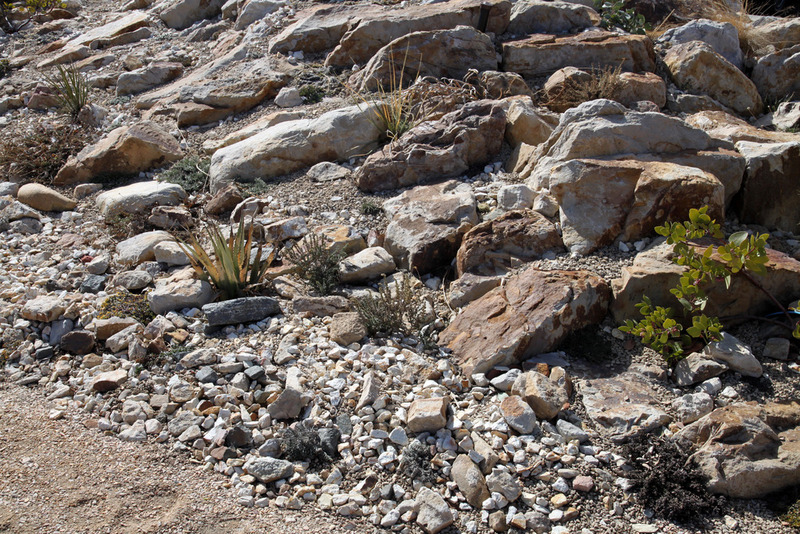 I guess most of us would prefer not to be dragged toward a coyote but perhaps TGYLW could harness that energy and you could move rocks into the proposed crevice garden? The problem with harnessing dog energy is avoiding the detours, though. That’s a nice-looking temporary fence in back, speaking of detours…. Your friend’s crevice garden is pretty spiffy. And he does need more plants as he was grumbling about winter losses. I need to build one of these myself. Probably this year; very likely next. 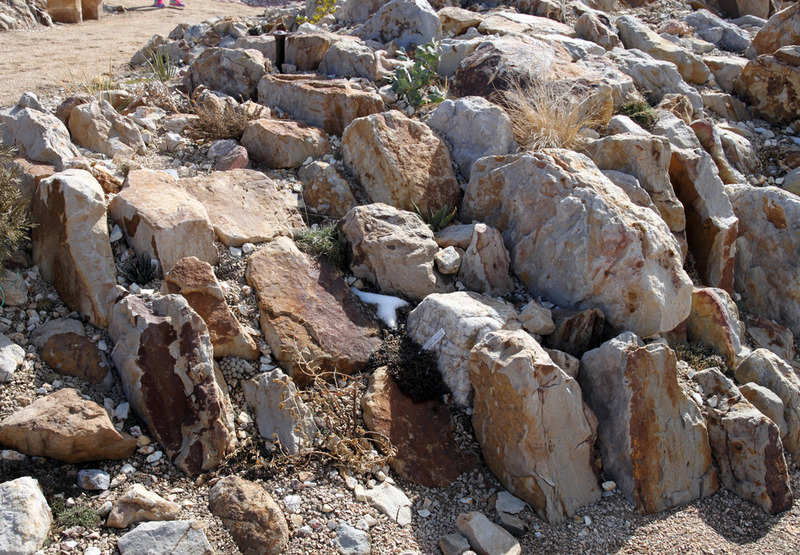 But I will start with a small scale trainer crevice garden because rocks are heavy. I need more crocus in my life. That’s Kenton Seth’s crevice garden at Apex, if I didn’t make that clear to everyone. I’ve met Kenton and don’t try to chomp him. The guy I live with gets to plant stuff in the garden, maybe even this week. I hear that if you pay someone to build you a crevice garden, they do all the lifting of stuff. Well, of course things are easier if you pay someone else to do them. Usually. Unless they are doing it wrong and then you have to sit there and babysit them and step in from time to time and then you wonder why you aren’t just doing it yourself. As you may guess, people LOVE to work for me. There is a crevice garden at the RHS Wisley Garden here in the UK. 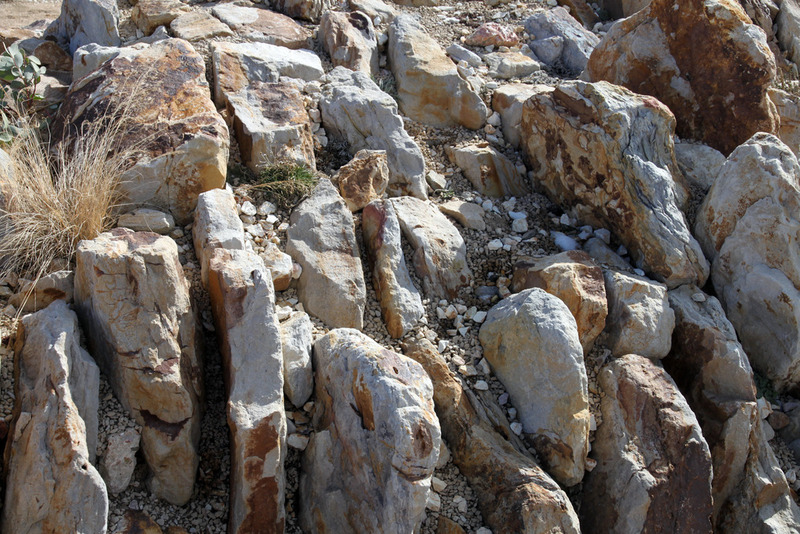 The problem is that even with a lot of plants in it, there is more rock than plant, and it never looks really attractive. Perhaps you could pass that observation on to TGYLW so that he doesn’t start shifting rocks about in your garden and injure himself. 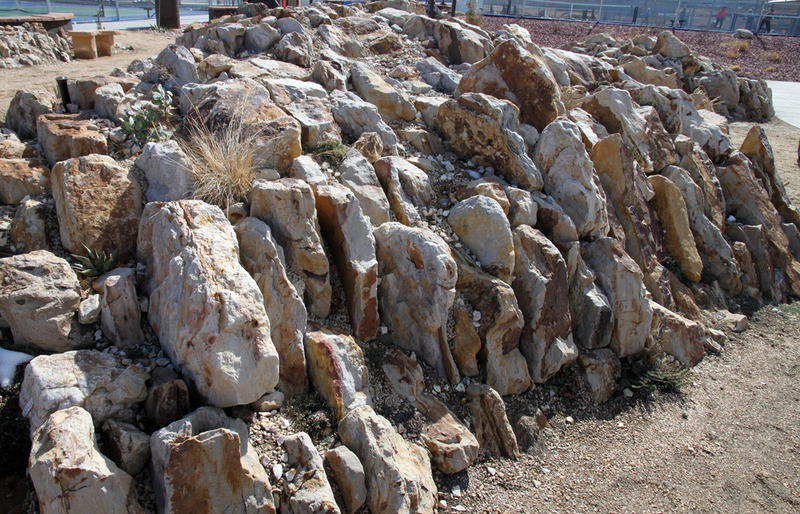 Oh, the rock gardens here are done. The “almond cake” style that Farrer disparaged so much. In the third photo of the crevice garden, Mani: did your Guy also get a picture of the last of the snow of 2016? That would be awesome! And I can only imagine that with such big ears as you have, dear one, that a windy day would sound especially loud and fearsome. I, with my comparably tiny listeners, have no trouble turning a deaf one to things that annoy me, except for vocal fry, which pierces me to my toes. Thanks, I do have excellent ears, and can hear everything except the guy I live with when he calls me. There’s something wrong with his voice, I think. He does vocal fry all the time, but differently. ore like “uuhhhh”. It is highly unlikely that that’s the last snow of the season. The Viburnum farreri is lovely, Mani, and so are all the crocuses, but when one reads about Norm and being even closer to him though on the other side, well, the focus tends to stay on, you know, *coyote*. You are right about the wind, the sounds can be scary when the strength really picks up. Out where I am, the click-clack of palm fronds can be LOUD. Things bang against the house too. Best place to be is in bed. I’m sure by now your weather has changed, and there may even be something new to complain about. I say you are being all virtuous and forbearing about being closed off from what looks to be an excellent part of your yard run. I think you totally deserve a Star award. Thanks, well, I do deserve the awards, of course, being purebred and all, and totally modest, and I got another one today. It’s supposed to get colder in the next couple of days and there is a great deal of complaining going on. I don’t know why Norm doesn’t want to meet me, but he does seem very much intent on not having anything at all to do with me. 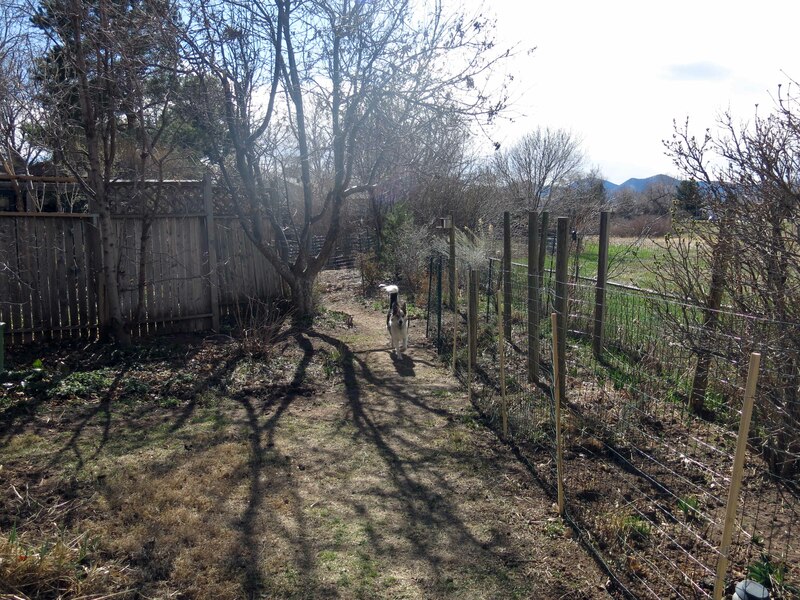 The other day, due to unforeseen circumstances (unleashed dogs in the open space), we went along the really narrow path which goes right behind our house, and it turns out that’s one of Norm and Celeste’s paths. Not a dog or people path. It was interesting to walk along. You might call it a “normal” experience, ha ha. Hi, here too on the Maritime Alps (Italy) Viburnum farreri has bloomed throughout most of the winter. You have an adorable dog! Thanks; I think the farreri might lose its flowers tomorrow night ….-9C predicted. Well I guess the answer to my question about the Viburnum farreri is that it will bloom until the temps go down to 16. Too bad.